It is great to be able to work well under your own steam, but for a company to function successfully, there also needs to be effective teamwork. Sometimes this happens easily but often, it takes time and effort to work well together. Everybody needs to learn to accept and understand each other and not all pull in different directions. Instead of using teamwork as an opportunity to show off or pull focus, each member needs to focus on the good of the group. Communication is the key to any effective teamwork. If you can’t share ideas and get your point across in a supportive environment then it will be difficult to get anything done. If people don’t agree, or have a problem then need to be able to tell the other members in a constructive manner. Also, each member needs to stay informed about any decisions or progress so that everybody is working together rather than in their own direction. You may think that if you are communicating effectively, then your are listening. But this isn’t always the case. You may be able to communicate your point well but are you actually listening to what your colleagues have to say about the subject? To truly listen you need to focus on what they are saying without judging or thinking about how you would change or counteract it. For a team to work effectively everybody needs to have a role. This may be a formal setup or it may just be knowing each other’s strengths and how you interact together best. If everyone is vying to be top dog or arguing over what they want to do, then nothing will actually get done. Nobody’s job in a team is less important as they all contribute to the overall success but allocating roles will help the team function successfully. The old adage – ‘fail to prepare, prepare to fail’ is true when it comes to effective teamwork. You need to know what you want to achieve and the parameters you have to act within, in order to be successful. If you don’t have the facts, no-one has roles and you barge straight in then the outcome is not going to be what you are hoping for. Plan your attack and how you can use your resources and skills in the most effective way. You may all be getting on well when things are rosy but as soon as something goes wrong, the fingers start pointing. Attributing blame within a team is never helpful and just lead to resentment and arguments. Deconstruct what happened and where you went wrong but take responsibility for the mistakes as a team rather than laying it on an individual. You would all take credit for any success so you all need to do the same for your failures. 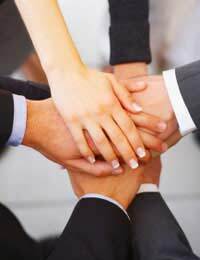 Effective teamwork is no something that is quick and easy to establish. Each member needs to communicate and listen properly while not trying to pull focus. Know what each person’s strengths are and how you can use these for the good of the group. Plan what you intend to do and be prepared to take the blame as a group as well as the credit.